VINTAGE COSTUME ANTIQUE JEWELRY MATCHING JEWELRY SETS - PARURES! Two Strand Deep Pink Porcelain Beaded Vintage Necklace And Clip On Earring Matching Jewelry Set - Parure. 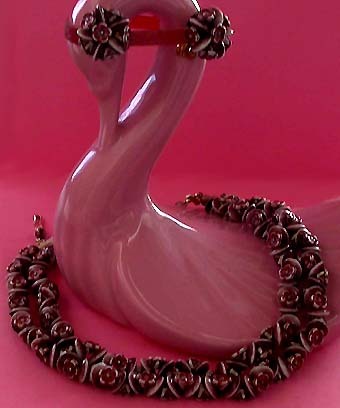 Item #S168134 - Two Strand Deep Pink Porcelain Beaded Vintage Necklace And Clip On Earring Matching Jewelry Set - Parure. Size: Necklace: Total length: 15". Earrings - 7/8" in diameter. Beautiful intricate workmanship! 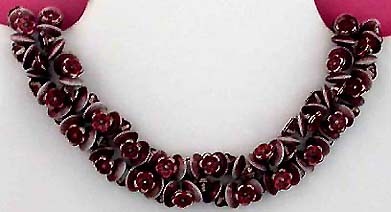 This gorgeous vintage necklace and earring jewelry set is done in groups of two lustrous disc shaped deep pink porcelain beads with a lovely cherry blossom bead in between. The groups alternate one another creating a thick round strand of amazingly gorgeous zigzaging pattern, and whichever way you turn the floral strand you'll see those lovely cherry blossoms cradled in between the porcelain beads. Such intricate design and workmanship can only be achieved by someone who has a lot of skills and also an eye for beauty. An unique and feminine vintage jewelry set to own! The wonderful matching earrings are clip backs. Excellent condition. A fabulous matching Jewelry set to wear at weddings, prom nights, pageants, parties, cruises and special functions! US$128.00. SOLD.